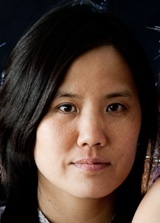 Evelyn Ch’ien is a researcher specializing in cultural and literary production in the 20th and 21st centuries. This includes production across several forms of media, including traditional writing systems, electronic media, and in a variety of sound and visual environments. At the University of Minnesota as an associate professor, she won funding to outfit classrooms with 25 portable studios to compose hip hop music and taught courses on hip hop music composition in America and Europe. She has been a professor and invited researcher at the University of Hartford (Hartford, CT), the University of Minnesota (Minneapolis, MN), the Universiteit van Amsterdam (Amsterdam, the Netherlands), Jean Moulin Université Lyon III (Lyon, France), and the Sun Yat Sen University (Guangzhou, China). She spent 2011-12 as a Fulbright senior research scholar in southern China, researching literature at the beginning of the republican era. Her book, Weird English (Harvard UP 2004), proposed a new theory about how to analyze immigrant expression. It articulated the distinction between accidental and purposeful bad grammar, demonstrating that purposeful bad grammar could be a code to understanding a culture’s politics and social affiliations. The book was reviewed in, among other publications, Library Journal (Aparna Zambare), Choice, Far Eastern Economic Review (Mitali Saran), Politics and Culture (“The Trouble with Normal English” by David Golumbia), The Globe and Mail (Toronto), The New York Sun (Ilya Marritz), The Chronicle of Higher Education, RMMLA, The Texas Observer, and The Morning Show at KPFA Radio (Berkeley, CA) and Hyphen Magazine.